Have you ever wanted to be an Air Traffic Control operator? You know, directing airplanes and helicopters to their designated landing strips? Do you like games that ramp in difficulty and get harder to complete the longer you play? Well Air Control might be the game for you. Okay admit it, being an ATC operator probably isn’t as much fun as it sounds, but as a mobile game it’s a great way to kill time. The goal is simple: Direct incoming planes and helicopters to their proper landing strips without causing a mid-air collision. 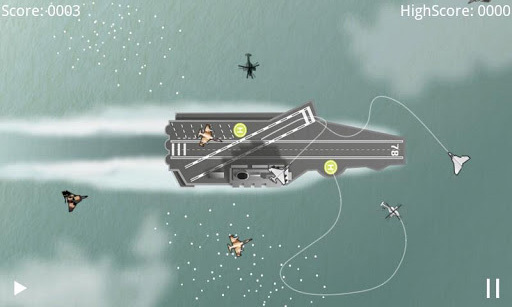 The more aircrafts you land, the higher your score. The longer the game lasts, the more populated the sky becomes. Sounds simple enough right? Well, it is at first as the game starts off slow and the planes will follow a path you draw with your finger. 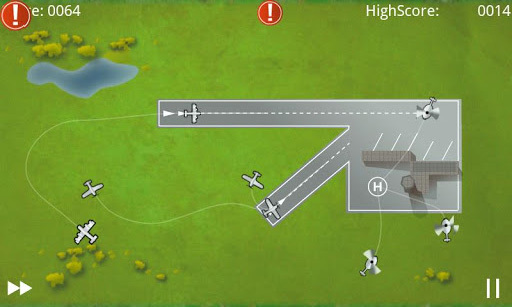 The difficulty ramps when you get different types of aircrafts that all want to land on the same airstrip but are flying at different speeds. Sadly, there are only four maps, but they are each unique in their own way. One has you landing aircrafts on a military aircraft carrier, another directing a zeppelin and other vintage planes, while the last two are more modern airport scenarios. Air Control tracks your best scores and puts them up on the leaderboard for you to see where you rank among others in the world, your country or even your city! The controls are simple and solid. Like Tetris, the gameplay is relaxing at first but becomes more hectic the longer you play. Oh and did we mention this game is addicting? Check it out on Google Play Store here.